FSC’s Department of Music presents ‘Tis the Season: The Christmas Gala with a riveting group of musical holiday favorites, beautifully performed by choral, instrumental, and string groups – and selected special music by other musical combinations. 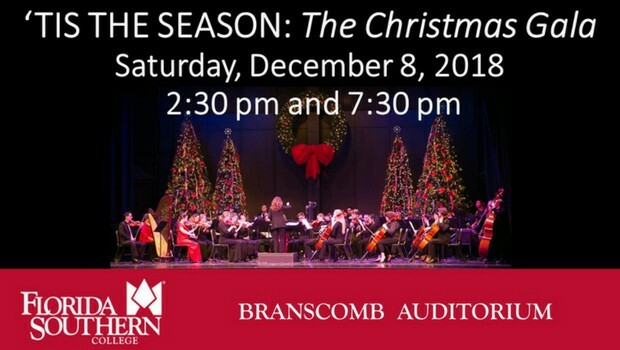 Among favorite pieces to be performed are Sleigh Ride, Christmas Song, and The Nutcracker (for orchestra/dancers), O Holy Night (FSC’s three pianists, vocal soloist, and choruses), and the concluding Christmas Carol Sing-Along for the FSC Symphony Band and audience. Come join us for a traditionally spectacular evening – filled with surprises! Saturday, December 8, 2018 – 2:30 p.m. and 7:30 p.m.